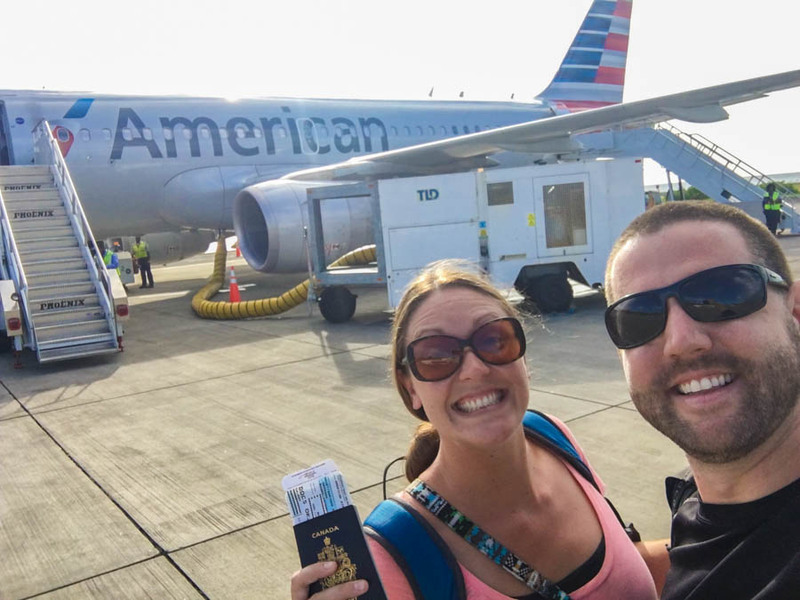 When we were planning our backpacking trip through Colombia, we decided to fly into Medellin first and start our journey from there. 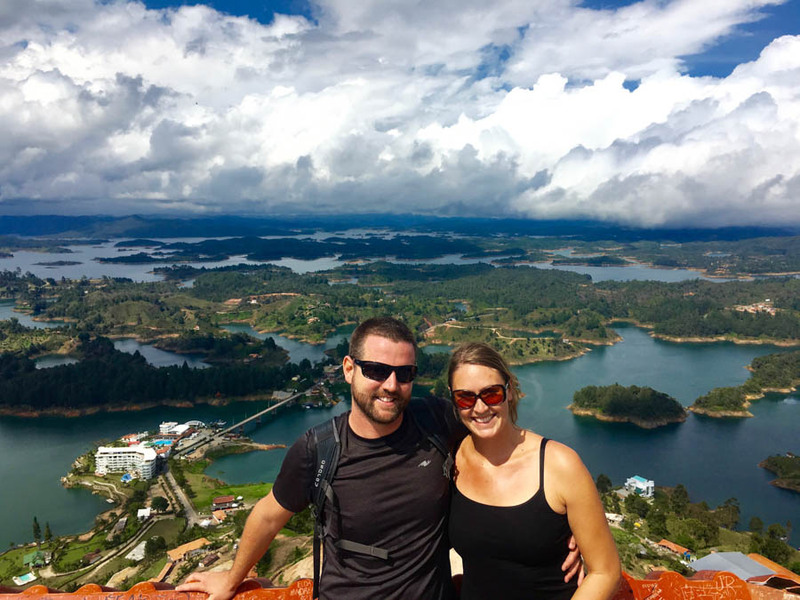 This was our first time in Colombia, and actually, our first trip to South America. Medellin is a city that we were very excited to travel to, but were a little unsure of as well. 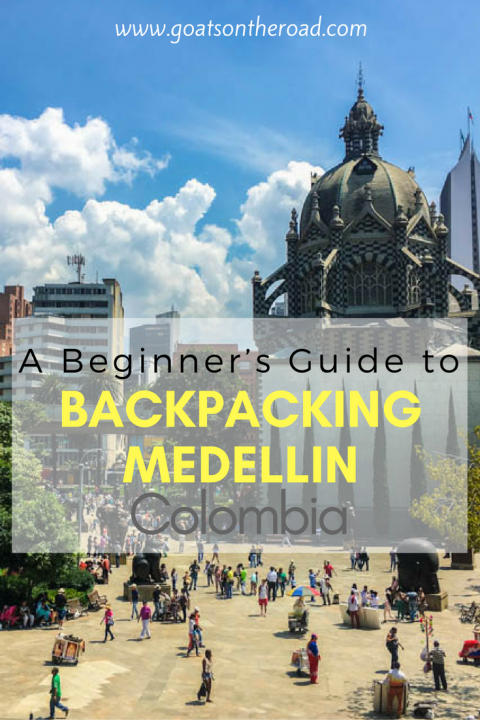 After spending one week in the city, we’ve put together this guide to help you on your backpacking trip around Colombia’s city of Eternal Spring, Medellin! The lineups for immigration are quite long at the Aeropuerto Internacional Jose Maria Cordoba. We waited in line for over 30 minutes to go through immigration when we arrived at 10:00pm. If you have a flight out of Medellin, make sure to give yourself a lot of time – the check-in lines can be massive. Because the immigration process takes so long, your bags will be waiting for you on the floor beside the baggage carousel! There is an ATM (apparently) on the 2nd floor. But, if you have some US Dollars with you, or Euros, etc. you can change them at the money changer. 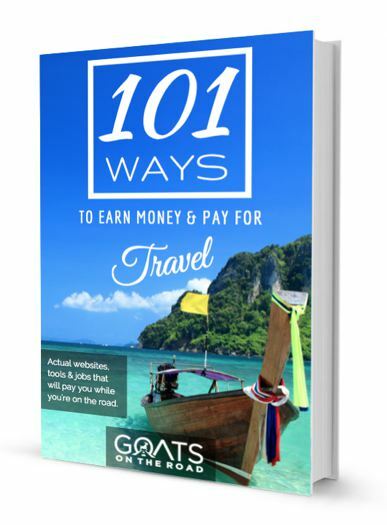 The rate here isn’t very good, however, so just exchange enough to pay for your taxi or shuttle bus. Note for Canadian Travellers: You must pay a reciprocity fee when you arrive at the airport. Before you will be stamped into Colombia, you have to pay 171,000 pesos ($73.36 Canadian Dollars). You can pay via US Dollars or Credit Card. You just pay it at one of the booths, and then the immigration officer will welcome you to Colombia! Get ready to cough up some cash Canadians! Medellin’s main airport (Aeropuerto International Jose Maria Cordoba – MDE) is about 35 kilometers SE of the city, and about a 40 minute drive to the popular backpacker area of El Poblado. The type of transport you will take to the airport will depend entirely on what time you arrive in the city. If you’re arriving very early, or late, you’ll probably want to take a taxi into Medellin. From the airport, you can take a yellow or a white taxi to the El Poblado neighbourhood for a fixed rate of 65,000 pesos ($20.75). This is the cost of the car, so if you have 4 people, you will only have to pay $5 each for a 45 minute – 1 hour drive. If you’re uncertain about travelling in Colombia, or big cities, this is the best way to get into Medellin. And actually, we think that this is the best, and easiest way regardless of your travel abilities! For couples, this is a no brainer, as you’ll spend almost the exact same amount of money. If you’re a solo traveller, ask other backpackers at the airport if they want to share a cab. Chances are, they’re going to El Poblado. However, if you need to save a few pesos, you can try out the mini-bus that shuttles travellers between the airport and the San Diego Mall (well, technically, next to the mall at the Texaco gas Station). The cost of this is 19,000 pesos ($6.00), and they run from 6:00am – 10:00pm. The times and rates change frequently, so make sure to call your hostel to find out the exact times and prices. Once you’re at the San Diego Mall, you’ll need to walk 4 blocks to the Exposiciones metro line stop, then ride the metro (2,150 pesos or $0.68) for a few stops to the El Poblado station. 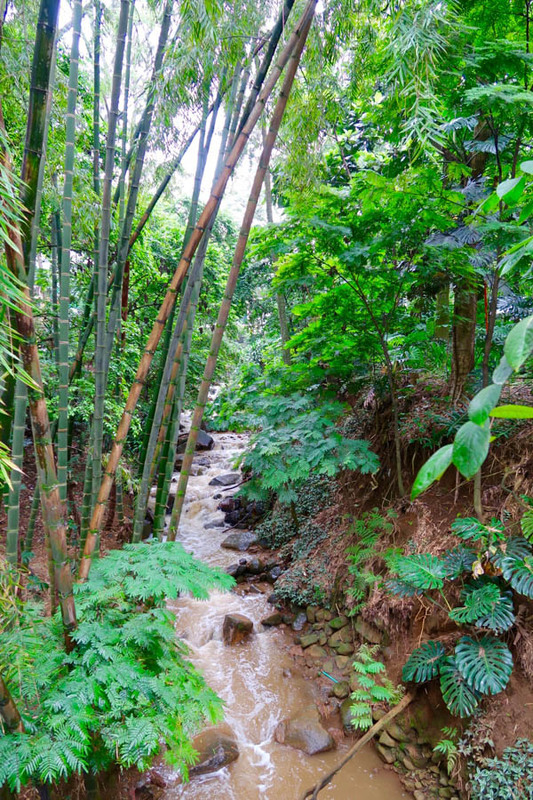 From there, you’ll need to walk uphill for about 10 – 15 minutes to your desired hostel. Or, you can take a taxi from the San Diego Mall to El Poblado for about 7,000 – 10,000 pesos. The neighbourhoods in the city are called barrios. 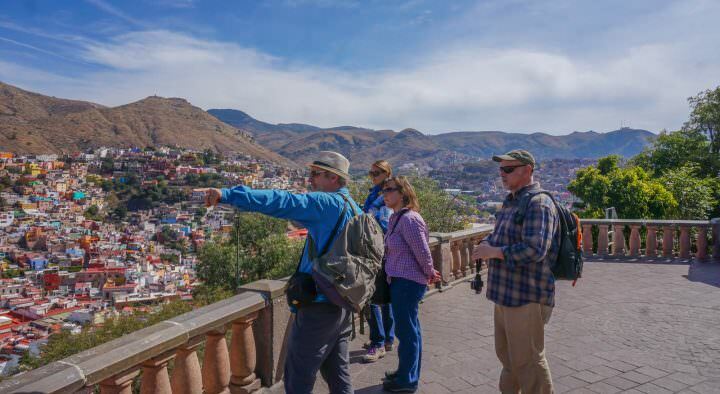 As a backpacker, you’ll most likely find yourself around the El Poblado area, Laureles or the Downtown (centro). When it comes to finding a place to stay in Medellin, most backpackers opt for the El Poblado barrio. This is where you’ll find all of the hostels, great restaurants, epic nightlife and shopping as well. The streets here are safe to walk around both during the day and at night. It’s a bit more upscale feeling and is definitely the more trendy area. Food here is more pricier than downtown, however, but you’ll find all sorts of national and international foods, plus some late-night street food. Laureles, Estadio and Suramericana are modern, middle class neighbourhoods. 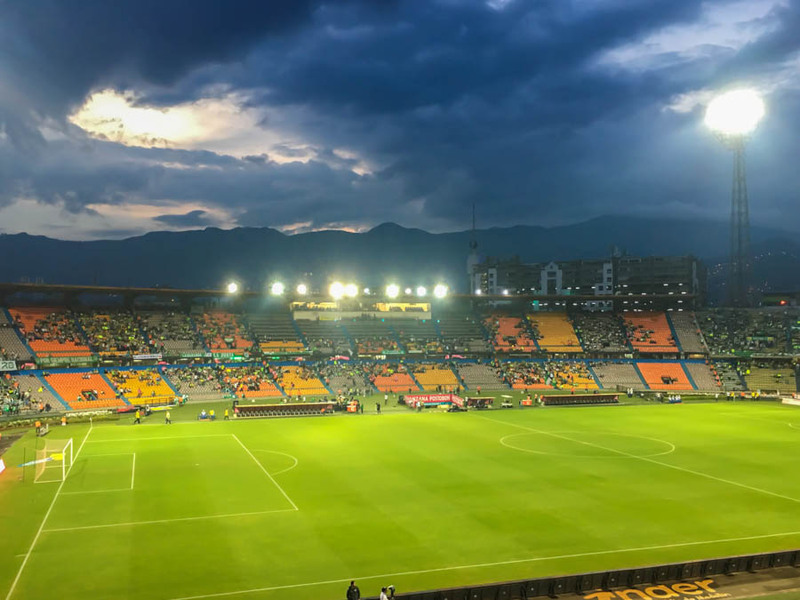 Here’s where you’ll find the football stadium, and some of the best salsa dancing bars in Medellin. El Centro is where you’ll find all of the main sites in Medellin, of which there aren’t all that many to be honest. Check out Plaza Botero and the famous works of artist Fernando Botero, visit the Museo de Antioquia, the Parque Bolivar, Veracruz church, and stroll along the Junin pedestrian street. This area is fine during the day, but at night it can be a bit sketchy. Comuna 13 is an interesting part of the city, filled with street art and escalators that are actually on the roads. It’s recommended to go on a tour here, as this area can be a bit dodgy. In fact, it was once the most dangerous area in Medellin. But, don’t be paranoid during your stay in Medellin. The city has completely revamped itself over the past years and places that were once extremely dangerous have been transformed. You’ll find busy plazas, public libraries and beautiful street art. As with anywhere, keep your wits about you, but there’s no need to be over the top about safety. 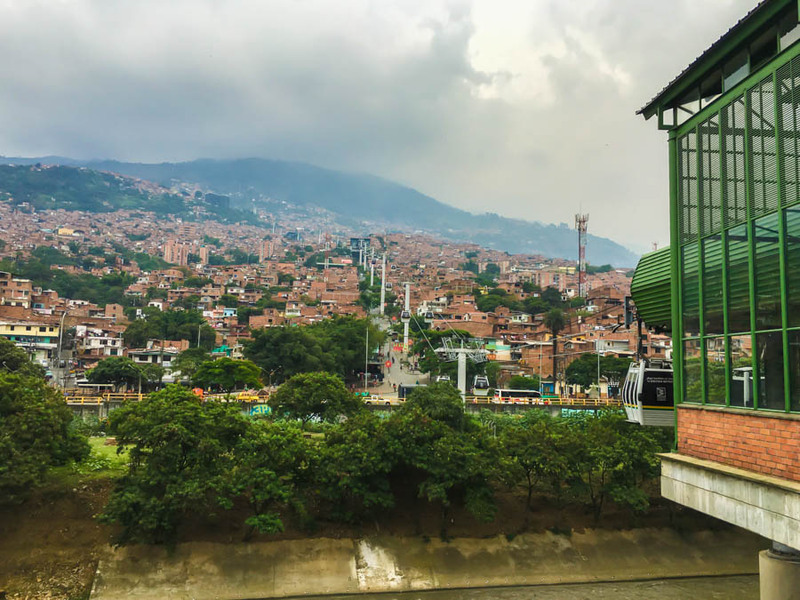 For first timers to Medellin, or for those who are looking to eat well, party hard, and feel secure at night, we recommend staying in El Poblado, but venturing out during the day to explore other barrios. Some people call this area gringolandia, due to the “western” amenities on offer and the other backpackers here, but when we visited in November, we found that many of the restaurants and bars were filled with Colombians, which was great! If you would rather book an apartment or stay with a host on Airbnb while in Medellin, why not get an Airbnb discount while you’re at it? Make sure you use our special $25 Airbnb Coupon Code and save money! In El Poblado, there many highly recommended hostels and hotels. We stayed at Maloka Hostel for seven nights in two different rooms, and can recommend them both. 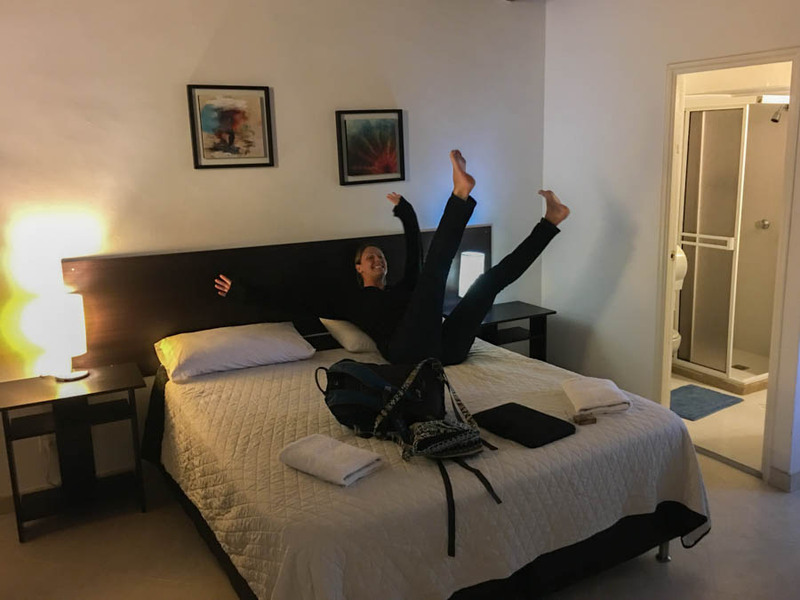 (Note: we weren’t paid to write about this hostel, and we didn’t get it for free. We paid for our room just like anyone else). This hostel has a cafe / small bar attached to it, but it’s not loud or very busy like the other ones nearby. The staff were friendly and answered the questions that we had about the city, and the wifi here is very good. There is a free breakfast available (which is served up by some of the sweetest women!). 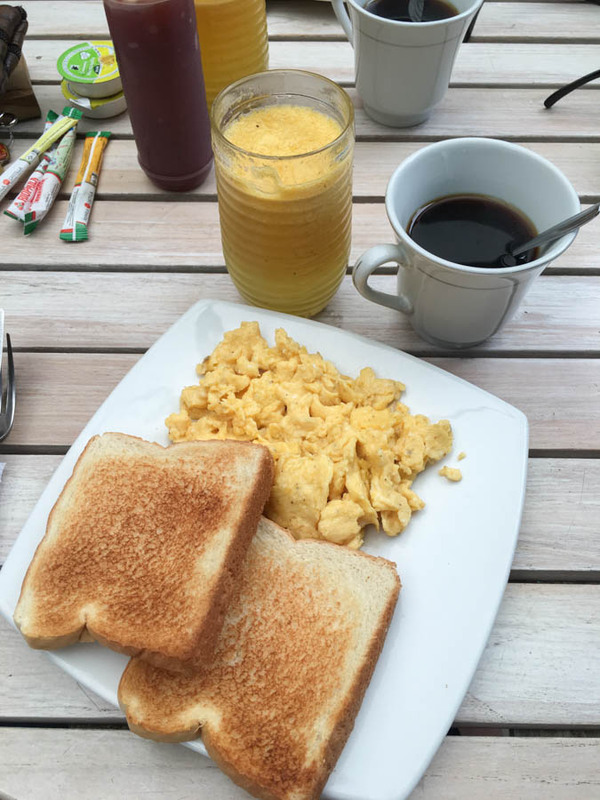 You’ll receive a plate of eggs with toast, coffee, fresh fruit juice and depending on the day, some fruit. Or, you can opt for cereal instead. 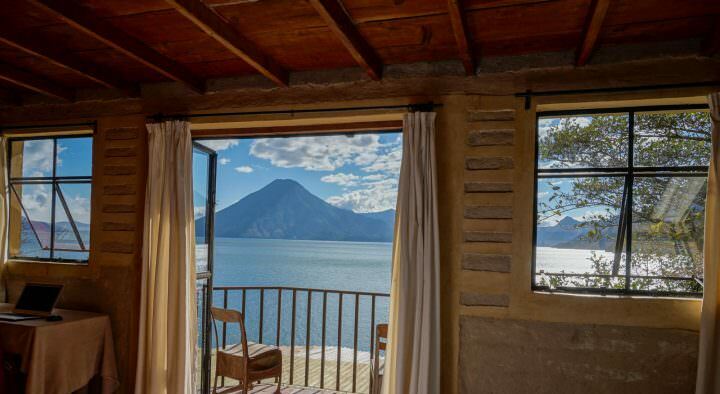 If you decide to stay here in a private double room, ask for the Verde or Dorado rooms. Both are clean, large and most importantly for this area of Medellin, quiet! Other hostels that are popular and receive good reviews from backpackers are Casa Kiwi, Black Sheep, The Garden of Blues, and Happy Buddha. The latter of which is known for being a party hostel. For hotels, Hotel Alameda de la 10 and Binn Hotel receive high reviews online. Address Carrera 34 # 7-05, El Poblado. See map here. 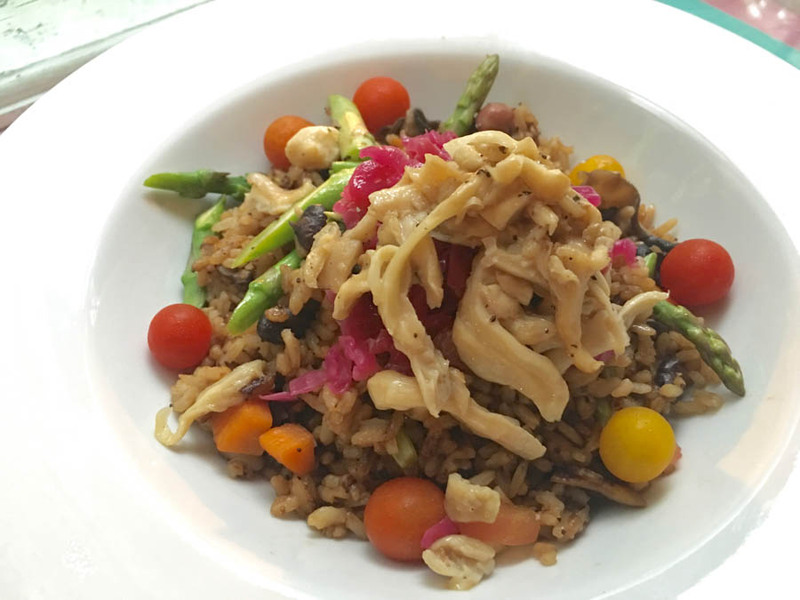 This is a newer restaurant in the city that serves up traditional Colombian food. It’s delicious and popular with locals and tourists. Portions are huge, order a 1/2 portion for lunch! Try the bean soup and the meat soup with corn. Both come with sides of avocado, plantain, salsa and rice. Address Carrera 37 #8a – 04 Vía primavera, El Poblado. See map here. We loved this place! The vibe here is great and the restaurant / bar is always packed with people. They have outdoor seating in a little “park” with little wooden stools for chairs and checkered tablecloths. The service is excellent, the drinks are tasty and so is the food. Try the tomato soup, prosciutto, mozza and arugula sandwich, and the sangria to wash it all down! Address: Carrera 35 #8A – 8 El Poblado. See map here. This is the hot spot for locals. They have a big screen tv which plays the important football matches. Seating is on small plastic chairs on the sidewalk, and there are some regular chairs with tables inside. This is more of a bar than a restaurant, but there is a great vibe here! Beers are 5,500 each ($1.75). Address: Parque Arvi. See map here. After an afternoon of hiking around the trails in Parque Arvi, this restaurant is the best spot to relax and have some wholesome food. There is a menu of the day, which served up some of the best veggie food we’ve had for 9,000 ($2.85) each. This included a plate of food and a fresh fruit juice. The food here is organic and vegetarian only. Address: Carrera. 35 #8A-3, El Poblado. See map here. This is a top choice for vegetarians. This little restaurant is always full, the food is delicious and there are many options to choose from. The falafel is delicious, and so is the brown rice with vegetables and quinoa! Both of us ate huge meals with a fresh juice for 62,185 pesos ($19.75). Address: Located across from Social Bar in El Poblado. This little stand is a great spot for a late night snack. 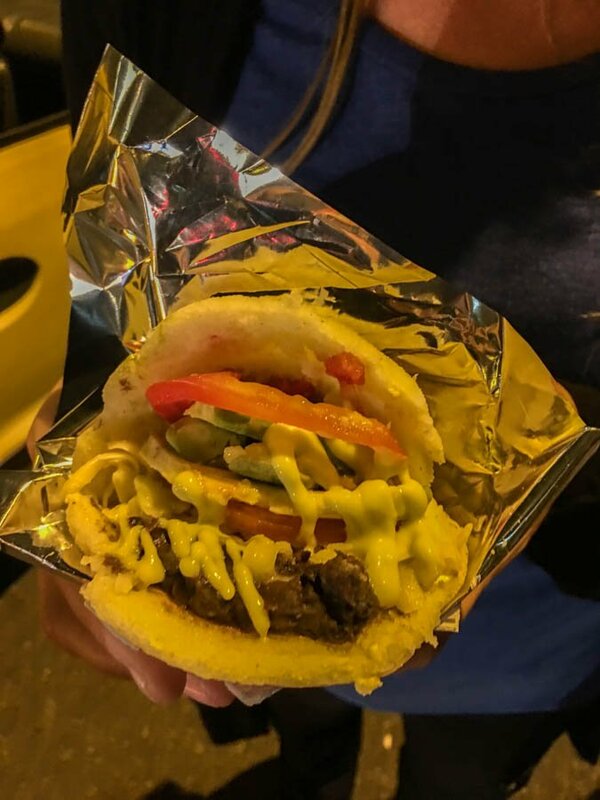 Arepas are made from ground corn and are popular in Venezuela and Colombia. The ones on the street can be stuffed with many ingredients. Try the cheese, bean and avocado! These cost 7,000 pesos ($2.20) each. Address: Carrera. 34 #7165, El Poblado. See map here. The microbrewery, BBC, has really good beers! There is a very cool bar with great pints. You can choose the size of beer you want as well. 4 large pints cost us 52,500 pesos ($16.00). Address: Near the El Covacho Restaurant, Carabobo #51-10 2do piso. La Candalaria. See map here. This is an excellent place to try buñuelo, which are made with a small curd white cheese and formed into doughy balls, before being fried. They’re sort of like a cheesy doughnut – so good. At 500 pesos ($0.16) each, it’s hard to eat just one. Address: Next to the Museu de Antioquia, Plaza Botero. See map here. This is an excellent cafe if you are looking for proper, cold brewed coffee. They also serve normal coffees as well, but the cold ones are delicious. Address: C. 8, #3537, El Poblado. See map here. This has some of the best brunches / breakfasts in town. Try the bagel with avocado and cream cheese and the eggs benedict! Yum. Other options include The Sushi Shop, Naan and Mondongos. Ride the Metrocable: Prior to 2004, residents of the city who were living in the less developed neighbourhoods, on the mountainside, had to spend 2.5 hours commuting to work. The buses and metro line couldn’t reach this part of the city as it was too steep. These days, the people can take the metrocable for free and travel from their homes on the hill to the metro line below. Cost for metroline & metrocable: 2,150 pesos ($0.68). Ride the Metrocable to Parque Arvi: After the Santo Domingo stop on the metrocable, switch lines to the “L” cable line and ride all the way up to Parque Arvi. This takes about 30 minutes and the scenery is stunning. Hike in Parque Arvi: At the top of the metroline at Parque Arvi, you can opt to just have some food and enjoy the little market, or you can go for a walk. Check out the Flora Trail which is a nice loop taking about 1.5 hours. See a Football Match: The football fans in Colombia are crazy!…in a good way. Check out one of the games at the Stadium and you won’t be disappointed. Tickets in the Alta Oriental area of the stadium cost 34,000 pesos ($10.80). Make sure to get a real beer after the game at one of the little stadium bars (only non-alcoholic beer is served at the match). 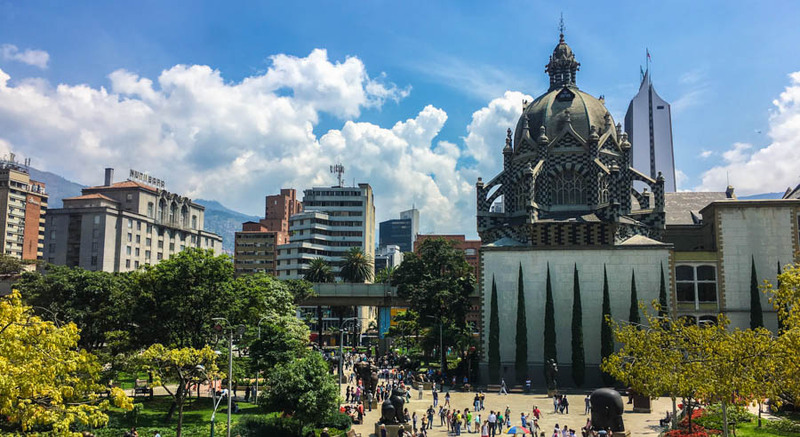 Go on a Free Walking Tour: There’s no better way to learn about the history of Medellín than going on a free walking tour with Real City Tours. You’ll walk around the downtown area while visiting many sites. You’ll eat some tasty food and learn about the culture of the Paisa people. Try Bandeja Paisa: This regional dish is a must try (unless you’re a vegetarian). A massive plate filled with a fried egg, sausages, ground beef, pork belly, beans, plantain, rice, avocado and arepa (made from ground corn). Do a Day Trip: The nearby colourful town of Guatape is a must visit. Make sure to hike up the granite rock, El Peñol! 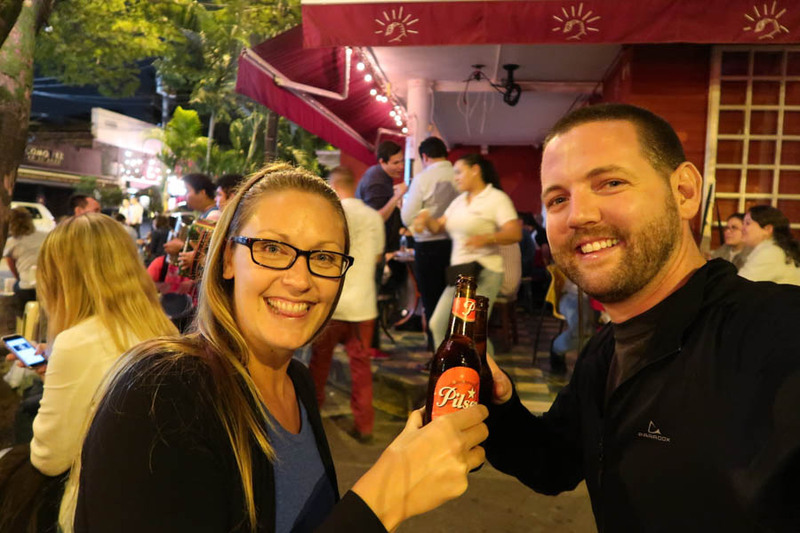 Party in El Poblado: The nightlife in this barrios is amazing. There are numerous bars, pubs and restaurants here. Go on a mini pub crawl and enjoy! Learn Spanish: You can ask your hostel to have someone come in and teach you Spanish during your stay, for about $10.00 / hour. Or, you can go to classes at somewhere like Toucan Spanish School. Lean to Salsa Dance: Check out DanceFree for private or group classes weekly. On the weekends, this turns into a bit of a bar with awesome dancing. Go Shopping: If you need to get some outdoor clothes, or just need some cheaper clothing, you can find some great things in Medellin. The Éxito store is like a Wal-Mart – it’s a great place to stock up on t-shirts, underwear and socks! You can find these stores all around the city, including El Poblado. For outdoor gear and pants, check out the Centro Comercial El Tesoro. There’s a NorthFace and Columbia store here. It’s a good idea to have a local SIM card in your phone when travelling around. In Medellin, you can purchase SIMs for 5,000 pesos ($1.60). You can purchase a Claro SIM at any little shops, or at the mall. Then, you will need to add talk time and data. We purchased 2GB of data, unlimited Facebook, WhatsApp and Twitter, plus 60 minutes of talk time for 50,000 pesos ($16.00). If you just want the talk time, it’s cheap at 2,900 pesos ($0.92) for 60 minutes. The tap water is safe to drink in Medellin, so don’t waste your money, or the plastic, on buying bottled water. 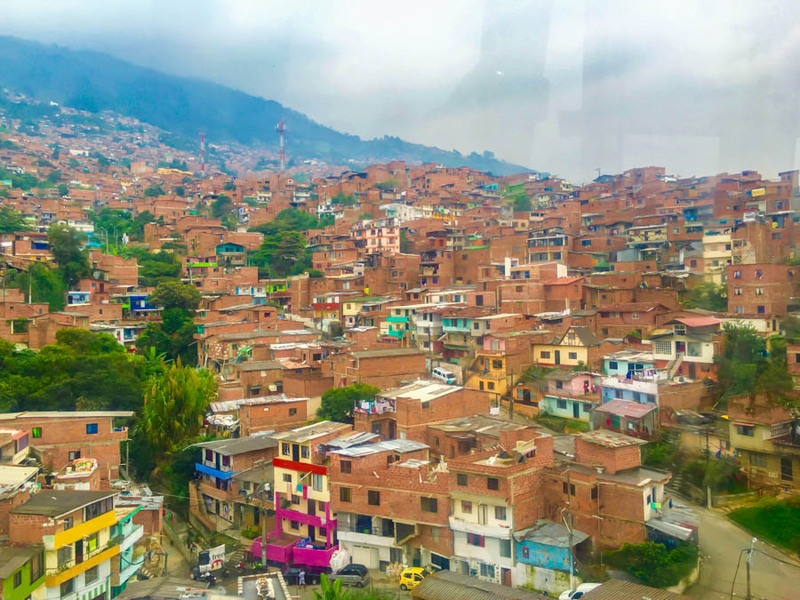 Check out our video from our week spent in Medellin! Great post! 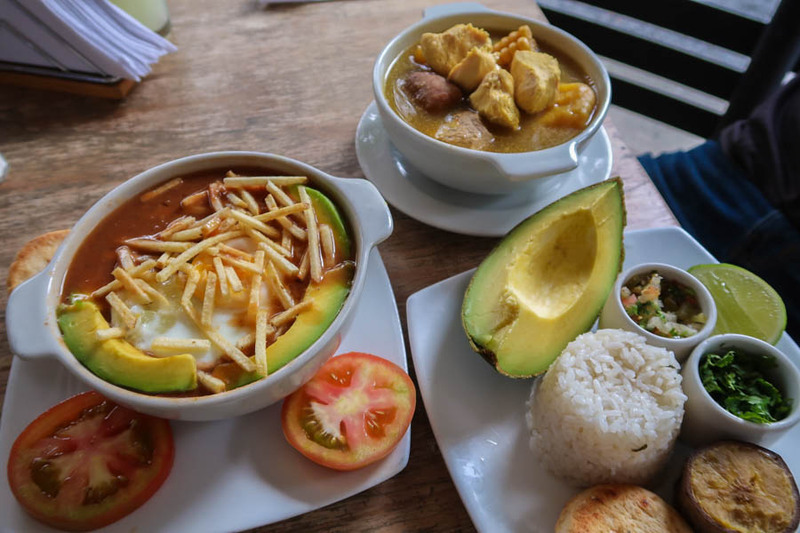 I’ve been hearing lots of good things about Medellin lately – especially about the food which looks delicious. It seems to be shedding the ‘unsafe drug capital of the world’ stigma (I’m guilty) and re-inventing itself like you said. It looks like such a cool place to visit. 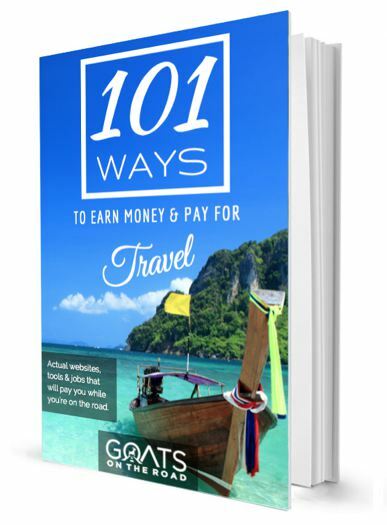 Thanks for writing up this great guide! Beautiful country. I am heading to Medellin in just over two weeks. But my aims are much more rustic. I have all the backpacking gear and camping equipment to be self sufficient. I want to head to the ancient sites nearby, like El Infieritos,and stay for a few weeks as I write. Can you offer any helpful advice? I just found your blog and I am so stoked to bring our family to Columbia this summer. We have travelled the world with our Canadian kids and have even lived in the Middle East! This will be our first time in South America and we are excited we chose Columbia as our first stop. Any advice for a family? Kids are 11, 13, 15.